Today I am sharing one of my favorite bundles from the 2019 Occasions catalog called Well Said. This is a huge stamp set, with a coordinating die set called Well Written. This bundle allows you to create custom sentiments and greetings galore for any project. And I love the script font of the dies! They can be purchased separately, or in a bundle at a discount! I have chosen to pair it up with the So Hoppy Together sale-a-bration stamp set. It's adorable, and you can get it FREE through the end of this month with a qualifying order. Do you love FREE stuff? The Well Written dies are not only versatile, but so easy to customize. I was quickly able to create the perfect play on words for my sentiment by cutting out the 'a' in happy, and replacing it with the 'o' cut from the love die, to make this punny greeting. Cut a piece of Soft Sea Foam cardstock 4 1/4" x 11" and score at 5 1/2"
Cut a piece of Call Me Clover designer series paper 3 3/4" x 5"
Cut a piece of Whisper White cardstock 3 5/8" x 4 7/8"
I used a sponge brayer with Pool Party ink to add a bit of color along the bottom edge of the Whisper White layer, than added the lily pad, which was cut using the Layering Ovals framelits. After stamping the frog, I colored him with Granny Apple Green and Pineapple Punch Blends, did a little fussy cutting, and put him on his lily pad with a dimensional. A Flirty Flamingo flower cut from the Well Written dies was the perfect accent on the lily pad. The Well Said bundle is quickly becoming a staple in my card making. Click on the link below to get your bundle today, and you can choose the So Hoppy Together stamp set FREE as your Sale-A-Bration item! While you are in my store, gather the rest of your supplies to create a punny card, and share it with me. I would love to see what you create! The first time I saw the Ready for Christmas stamp set, I saw the garland stamp as a hairy spider leg. Please don't ask why. I don't know why. But I ordered this bundle because I had to make today's card! It came out just as I envisioned! That is not always the case! Often those crazy visions turn into epic fails. But I love how he turned out! And now that I have that hairy spider leg out of my mind, I can move forward, and create some Christmas cards with this bundle, because it is amazing!! the Pumpkin Pie card base is cut 5 1/5" x 8 1/2" and scored at 4 1/4"
the background is Spooky Night designer series paper cut 5" x 3 3/4", on a layer of 5 1/8" x 3 7/8" Basic Black cardstock. For the spider, I stamped in VersaMark ink and heat embossed with clear embossing powder so he had texture, and stood out better on the basic black cardstock. What do you think? Can you make a fall or Halloween card using this bundle? Ready for Christmas Bundle ©Stampin' Up! Click on any of products below or use my Shop Now tab in my sidebar to order it. Than show me what you create! I love this sentiment. It's from the Count My Blessings stamp set in the new Holiday Catalog. I will use this a ton this holiday season! This card also uses the Ruffled Dynamic Embossing Folder, from the Annual Catalog, to create the background, and the Painted Harvest stamp set for the leaves, which are punched out with the new Leaf punch. I dressed it up a little with gold glimmer paper, and Year of Cheer metallic washi tape! I also added a Touches of Nature Element. I love veneer embellishments, but I struggle with how plain they sometimes look on a project. In come my ink pads! Did you know you can color them to coordinate with any project? Yup! You sure can! And it is super easy! This adds a perfect touch to any project! Do you need a Holiday Catalog to start your holiday crafting? If you live in the United States and don't have a demonstrator, I would love to send you a catalog! Simply contact me through the link in my sidebar, and I will get one to you! Would you like to create this card? Click on any of the links below to head on over to my store! Loving the Holiday catalog! I have started crafting with new catalog products, and thought I would share a little peak of what you have to look forward to! This card is loaded with new products! Can you pick them out? This product suite, Painted Autumn, is one of my favorites in the entire catalog! When fall comes, working with fall colors become my favorites! The Painted Autumn designer series paper is gorgeous! Hand painted fall patterns with beautiful watercolor patterns on the B sides. It will be hard to pick which side to use! Want to see it for yourself? You may still pre-order a paper share from me, and it includes 1/4 of a pack to create with! For this card, I layered on the details, and for extra interest, added some of the awesome new Embossing Paste from the annual catalog. This is so fun, and really easy to use! It dries fast, and is flexible. It can be colored, too! To recreate this card, cut a card base of Cajun Craze cardstock 5 1/2" x 8 1/2" and score at 4 1/4". Cut a piece of Early Espresso cardstock 3 7/8" x 5 1/8". Choose your favorite pattern of Painted Autumn dsp, and cut to 3 3/4" x 5". Using the Embossing Paste, and Pattern Party Decorative Masks, add a layer of embossing paste to the dsp. Allow to dry, than adhere to the Early Espresso layer. Adhere this layer to your card front using dimensionals. Using the Painted Harvest stamp set, stamp 2 sets of leaves with Lemon Lime Twist ink on Lemon Lime Twist cardstock. Punch out with the Leaf punch. Stamp sentiment in Early Espresso ink on Very Vanilla cardstock. With the Pick a Pumpkin stamp set, stamp a pumpkin of your choice in Pumpkin Pie ink over the sentiment. Punch out with the Everyday Label punch. Punch a second label from Early Espresso cardstock. Cut the espresso label in half length-wise, and adhere behind sentiment label to create a layered look. Layer leaves and trim of choice to back of sentiment, and adhere to your card front with dimensionals. I chose the 1/4" Copper Trim from the annual catalog on my card, but linen thread, burlap ribbon or copper thread would work well, too. To finish off your card, use Early Espresso ink again, and stamp a sentiment on the inside of your card. Have you received your Holiday Catalog yet? If not, and you do not have a demonstrator, but live in the US, contact me through my sidebar link and I will send one to you! You won't want to miss it! You also still have time to pre-order a Holiday Catalog Paper Share from me. See the post here. Thanks for hanging out, and stop back soon! Creating with the Delightful Daisy Suite of Products from Stampin' Up! Welcome back! My last post featured a card using the Delightful Daisy designer series paper. Today I wanted to share the rest of the Delightful Daisy suite with you, with this card. Creating with a suite of products makes crafting easier. All the products coordinate perfectly, which makes putting a project together seamless. Suites often contain stamps with a matching punch or die set, designer series paper, trims, and sometimes, embellishments. This particular suite, Delightful Daisy, contains the Daisy Delight stamp set and coordinating Daisy punch, Delightful Daisy designer series paper with matching cardstock, and ribbon. The best part about the coordinating stamp set and punch, is a discount when purchased together as a bundle, not only making crafting easy, but saving money as well! Quick Tip: When planning projects, consider purchasing a coordinating suite of products. This helps save money while making crafting fast and easy! To recreate this card, cut a card base of Wisteria Wonder cardstock to 5 1/2" x 8 1/2" and score at 4 1/4". Than choose the designer series paper pattern (dsp) of your choice, and cut to 2 7/8" x 4 1/4". I chose to layer Calypso Coral cardstock under my dsp, which was cut to 3" x 4 1/4". Adhere the dsp onto the Calypso Coral cardstock layer. Tie a piece of Delightful Daisy double-stitched ribbon around the dsp layer, and adhere to cardbase. Stamp the sentiment from the Daisy Delight stamp set above the dsp layer in Wisteria Wonder ink. Than stamp 3 large daisies in the same ink, and punch with the Daisy punch. Stamp centers on each flower with Daffodil Delight ink. Adhere daisies to card front. I chose to use dimensionals on 2 of the daisies to add depth to my card. Trim parts of any daisy extending past your card edge. Color the daisy centers with Wink of Stella to finish the card off with a little shimmer. When you shop for card making supplies, do you purchase suites? Stampin' Up! has 15 product suites in the current Annual catalog. Need a catalog? Contact me using the Contact Me link in my sidebar. I will be happy to send a catalog to you. In the meantime, click on any of the products below to go to my store and build your suite of products. Hi Friends, I am back today with one last project using the A Little Wild bundle. This bundle has been really fun to create with! Have you ever found a stamp set or bundle that you start making a specific project with, than you find yourself creating more and more with it, because it is so fun to work with? That's how I feel about this bundle! As you know from my last post, I am in love with the little bees! So this project was made specifically for those little guys, and of course, I had to make a bee hive with little bees inside! What better way to do that, than with a shaker card! 4 1/4" x 11" piece of Daffodil Delight cardstock, scored at 5 1/2"
Stamp the bee hive randomly across the front of the Whisper White layer in Daffodil Delight ink. Stamp 3 sets of bees on the 2" Whisper White piece in Archival Black ink, than color them with the Daffodil Delight watercolor pencil. Using the bee hive die from the Little Loves framelits set, die cut a hive just off center near the bottom of the Whisper White layer, and use the bee die to cut out the bees. Now, make the shaker. On the back side of the Whisper White layer, adhere the piece of window sheet using Fast Fuse adhesive. Than, applying Foam Adhesive Strips to the window sheet, outline the bee hive. Place some bees (face down) inside the hive. I also added some black and irridescent sequins from the Metallics Sequin Assortment. Now, you can choose to apply the Basic Black layer over the top, but I cheat, and add a second layer of window sheet over this area. I find it is easier to line up my layers, so this is what I did. I than adhered the front layer to the Basic Black layer. Next, tie a double piece of Basic Black solid twine around the center, and adhered this piece, with dimensionals, to the Daffodil Delight card base. For the sentiment, I used the Cool Treats stamp set because the word Sweet was perfect! This was also stamped in Archival Black ink. For the right edge of the sentiment strip, I lined up the bee hive die along the edge of the strip, and die cut an edge to fit along the shaker window. Punch the other end with the Banner Triple Punch, and adhere along the bottom of card, lining up with the hive. Embellish as you choose with the little bees. The colors I choose for this card are simple. You could substitute Crushed Curry if you wanted a bolder golden color. I hope you enjoyed my project! I would love to see what you are making with this bundle! If you don't have it yet, use the Shop Now tab in my sidebar to head over to my store or click on any of the product images below, and get it during Bonus Days! During Bonus Days, for each $50 you purchase, you get $5 to spend in August on anything you choose! So it is the perfect time to treat yourself! And because I love sharing great deals with friends, I have to let you know the Christmas in July special is almost over! Would you like over $200 in Stampin' Up! for only $99? Than join my team! This is an amazing deal! In addition to the starter kit, where you choose $125 in product of your choice plus get a month of Paper Pumpkin, you will get the Essentials Gift Pack with $72 in products added to it!! What is this? 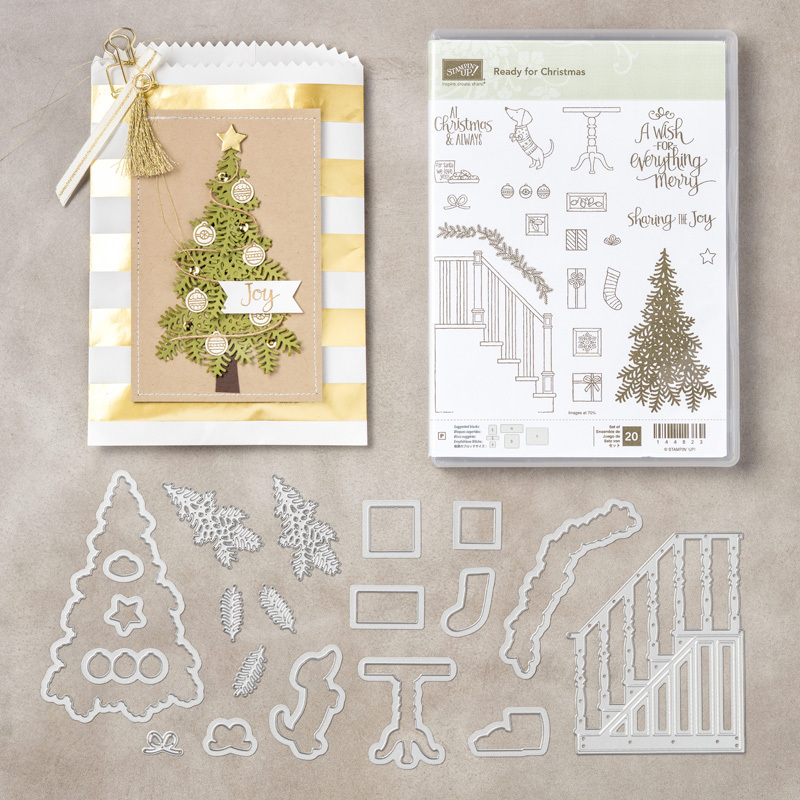 It is an assortment of stampin' basics, which includes paper snips, a bone folder, SNAIL adhesive, two D acrylic blocks, a pack of grid paper, and a brand new not yet released stamp set from the Holiday catalog, called Carols of Christmas. This is all FREE and in addition to your starter kit, and Stampin' Up! even pays the shipping! This ends on July 31st, so don't let this deal get away, join now! Melanie Hockin, Independent Stampin' Up! Demonstrator, I am responsible for its content. Stampin' Up! does not endorse the use of or contents of the classes, services, or non-Stampin' Up! products I may offer here.